Genesee Brewing Co./ High Falls Brewing Co. The following notes are made after a mouth wash with room temperature sparkling water. These notes have not been influenced by reading promotional material or any other review of this brew. I am including this preface to inform the reader of any and all circumstances that might be conceived of as creating a biased review or a conflict of interest regarding the choice of words used in the following review. I could go on and on with semi-legal jargon but I guess you will just have to trust me eh? Appearance: A crystal clear amber brew is carbonated with tiny bubbles that form a rich head of sandy small and medium bubbles. The Belgian Lace is noticeable as the head slowly falls. Aroma: The first impression is of sweet roasted grain with a hint of apple. The second visit revealed a honey accent and the third nose dive served only to get the olfactory sense calibrated. Flavor: After the refreshing chill there is a slightly sweet sensation that ebbs while a slowly surging tang grows but doesn’t crest. The second sip features the hop tang that edges toward a metallic touch. The third swallow got my nasal passages acquainted with the hop oils used and quite charmed they were. Mouth feel: There is a full feel to this one. 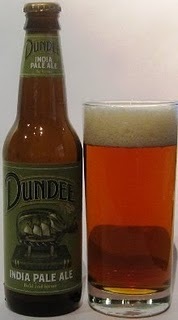 Finish: The tang of the hops lingers but is also joined by a burnt sugar flavor friend. Comments: The neck label notes “Be bitter”… I couldn’t agree more, the operative word being “more.” A touch more hops would have made this a remarkable example of an American India Pale Ale. As I sipped this brew I would have very much liked to have had a medium rare, thin sliced roast beef rye bread sandwich dressed with salt, pepper butter, lettuce and sliced tomato.